ABOVE: Bonnie Guldenschuh holds baby Connor, who is recovering from Neonatal Abstinence Syndrome. Guldenschuh is a volunteer with Faith Forward’s Angel Arms program, which cares for infants born with drug dependence. Faith Forward is one of the organizations benefiting from CFWC’s Opioid Impact Giving Circle. BELOW: VonZell Wade (right), cofounder of Lost Dreams Awakening, speaks with Ethan Faybik. 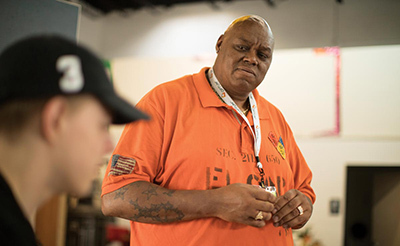 Wade uses his own experience with substance abuse to help others in recovery. Mark is a former communications intern at The Pittsburgh Foundation. OVER THE PAST DECADE, the number of overdoses per year in Westmoreland County has increased almost fourfold — from 50 in 2007 to 193 in 2017. In response, a group of concerned citizens is taking a unique philanthropic approach and empowering Westmoreland County nonprofits that are fighting the opioid epidemic. VonZell Wade, Ph.D., once struggled with substance addiction. Now he runs the New Kensington–based nonprofit Lost Dreams Awakening, which he launched in 2015 with his wife, Laurie Johnson-Wade, to provide a safe space for people struggling to recover from substance addiction. The organization was among seven nonprofits that took part in the first-ever Impact Giving Circle organized by The Community Foundation of Westmoreland County (CFWC) in 2017. Lost Dreams Awakening, along with Faith Forward, a Latrobe-based nonprofit dedicated to addiction recovery and counseling, were selected by participants to receive $25,000 each over two years, starting this year. The funding, Wade believes, will save lives. Wade started using alcohol and drugs at age 8. At age 23, after four years of using crack cocaine, he got clean. He says he owes his recovery and happiness to his wife, who was also using when they met. She got sober first, which inspired Wade to do the same. He recently turned 50 and marvels at how much his life has changed. Wade was among the nonprofit experts who spoke to participants in the Impact Giving Circle organized by CFWC in collaboration with The Pittsburgh Foundation’s Center for Philanthropy. Impact Giving Circles bring together like-minded individuals who meet once a month over a four-month period to combine resources, learn about an issue and collectively make grants. For this Impact Giving Circle, 20 participants donated $1,000 each, and CFWC contributed $30,000 from its unrestricted grant fund, creating a $50,000 pool for Giving Circle members to allocate to Westmoreland County nonprofits fighting addiction. it possible for us to have a bigger impact with our funds." In 2017, Wade says, Lost Dreams Awakening helped nearly 500 people receive treatment or referral. The Impact Giving Circle funding will be used to train new certified recovery coaches to help meet increasing demand for treatment services. According to CFWC Executive Director Phil Koch, key aspects of the Impact Giving Circle are learning and empathy. Participants met with staff from Westmoreland County Drug Overdose Task Force and Prevention Point Pittsburgh, who provided an in-depth look at how different organizations are fighting the opioid crisis, Koch says. Faith Forward primarily serves infants and children who, because of their parents’ drug use, are born into addiction. The organization also provides counseling and other services to parents and caregivers recovering from substance addiction, says Founder and Executive Director Dawn Hennessey. Faith Forward is using its Impact Giving Circle funding to renovate a donated house in Latrobe where the organization provides housing to children whose parents or caregivers are in rehab facilities. Hennessey says they also plan to expand the nonprofit’s Angel Arms program, in which trained volunteers snuggle and nurture babies born into addiction. Her approach resonated with Impact Giving Circle participant Michael Reese, who has lived in Greensburg for most of his life and experienced the effects of the epidemic. “I have had to face too many visits to funeral homes for friends over the last decade. That’s accelerated over the last two years,” says Reese, a financial advisor for Janney Montgomery Scott LLC in Ligonier, which refers clients to CFWC for charitable guidance. Reese, who is also a member of CFWC’s Visionaries group for new philanthropists, says he wanted, most of all, to understand the opioid crisis so he could teach his children how to make good choices. Based on the success of CFWC’s opioid Impact Giving Circle, a second Impact Giving Circle focused on opioid addiction is underway now in Allegheny County hosted by CFWC’s parent organization, The Pittsburgh Foundation.